The 2017 ITTF World Junior Circuit Finals have kicked off in Luxembourg, with Australia’s Michelle Wu and Rohan Dhooria taking the court for Oceania. It was a tough opening day for the athletes from Down Under. The duo were unable to put a win on the board. There was some consolation for Michelle Wu who was able to take a game off Thailand’s Jinnipa Sawettabut, going down 4-1 (3,3,-2,2,8) in her opening match. 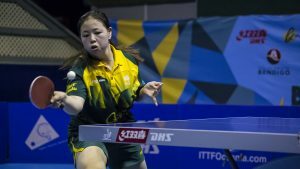 Hong Kong’s Wong Chin Yau then defeated Wu in straight games in the following match. Meanwhile, Rohan Dhooria went down in straight games against both Egypt’s Youssef Abdel-Aziz and France’s Bastien Rembert. The Australian’s final match in the group will be against top seed Kanak Jha from the USA. Check out the full results from the first day of action in the Girls’ Singles and Boys’ Singles.